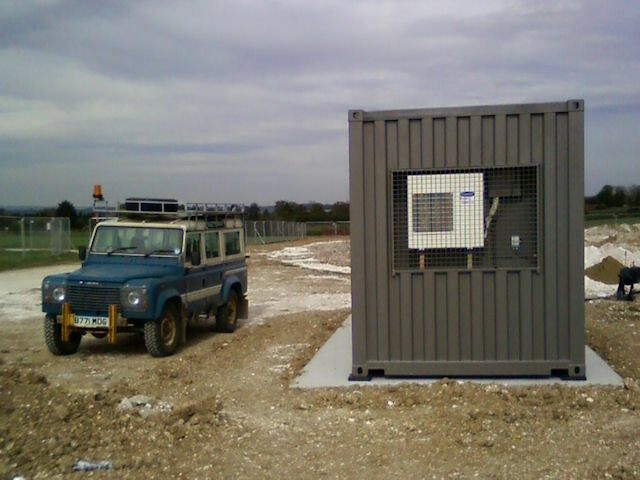 The RF-container was placed in its final position last week and it is now being fitted ready to start accepting cables and electronics. One of the first things to be sorted out is the electrical work, including not only the introduction of power, but also in grounding the cabinet. This first picture shows the RF-container, now in place. Also featured is the trusty observatory Land Rover that has faithfully carried the staff and a lot of cables, tools and equipment back and forth between the main observatory building and the LOFAR field. 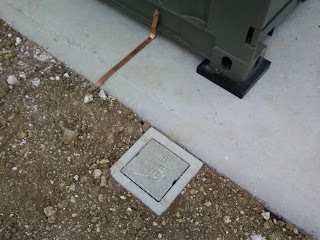 This picture is of the base of the RF-container showing the earth strap and ground-pin cover. Notice how the RF-container is up on rubber blocks.